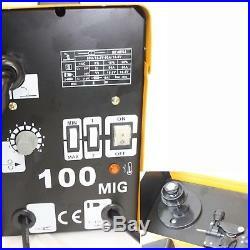 MIG 100 110V FLUX CORE WELDING MACHINE NO GAS WELDER+ Auto Darkening HELMET. 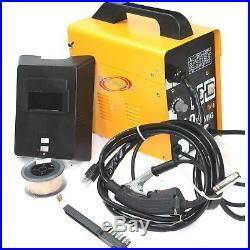 High quality dual MIG-100 MIG welder comes with torch, tip, grounding cord, clamp and protective welding shield. Flux-cored Welding Wire Self-Regulating Feed Control. Wire Capacity: 0.035" or 0.030" I. Includes 4 Spool of Flux Core Wire. Includes Spare 0.035 Welding Tip. Rated AC Input: 120 VAC, 60Hz. Ground Cable: 6AWG, Single Insulation, 6'-0 Torch Cable: 6AWG. Power Cord: 3-core, Double Insulated. 14AWG Thermal Overload: 6min shutdown. 10min back on with light Wire Tip: 0.030" and 0.035". Wire Size: 0.030"-0.035" Flux Core Wire Wire Spool Size: 4 Diameter. Overall Dimensions: 14.5" x 8.25" x 12.25. 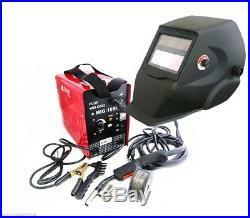 1pc Auto Darkening Welding Helmet (color may vary). Please make sure you order the correct item as orders cannot be altered after the order is paid for. 5-8 days to your door, we do not guarantee transit time. We welcome and treasure all of our customers. Listing and template services provided by inkFrog. The item "MIG 100 110V FLUX CORE WELDING MACHINE NO GAS WELDER+ Auto Darkening HELMET" is in sale since Friday, March 23, 2012. This item is in the category "Business & Industrial\CNC, Metalworking & Manufacturing\Welding & Soldering Equipment\Welding\Welders, Cutters & Torches\MIG Welders".